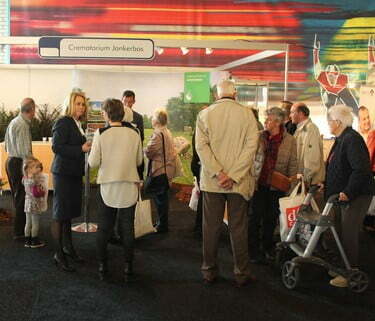 From 9 to 11 April, Jonkerbos Crematoriumattended the 50+ exhibition BeleefPlus in Nijmegen in the Netherlands. Staff at the crematorium’s stand provided visitors with information about the many commemorative options. The stand was very busy, with the new ‘wishes’ form in particular attracting a lot of attention. In addition to the ‘wishes’ form, there was a lot of interest in the various options offered by Jonkerbos. These include ceremonies, for example, or condolence options. But the new and delightful urn garden, with monuments shaped as tulips, is also a great option, as are the personalised memorials you could select. Would you like to find out more about the ‘wishes’ form, or to download it? Then click here.